Alumicolor Triangular Drafting Scales are made of extruded aluminum, and treated with a photo anodizing process that assures a smooth, tick-free finish and permanent markings that are resistant to cleaners and solvents. A hollow core makes this drafting scale infinitely portable. 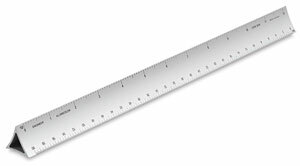 Hollow Triangular Drafting Scale, Engineer 12"